300P PacScan Pachymeter - Gold Coast Ophthalmic Instruments, Inc. Measurement accuracy and repeatability are assured by each scan actually consisting of 256 individual measurements and an automatic measurement algorithm to ensure that only scans with proper probe alignment are accepted. The high probe frequency and processing algorithms enable measures as thin as 125 microns, for measuring corneal flap or bed, and multiple corneal maps are available. Also comes standard with central corneal thickness correction calculator for measured applanation IOP. The PacScan 300 series offers extreme portability, weighing less than 6 lbs (3 kg), and comes with optional padded carrying case. Optional printer allows for hardcopy record of corneal thickness measurements. Data download and scan viewer software option also available to create permanent digital archive of scan results. Two probe styles are available, depending upon user preference and scanning application, a 45 degree angled probe for when patient is in supine position and a straight probe for when patient is in sitting position. Built-in probe sensitivity test and calibration check ensures continued accuracy of system. 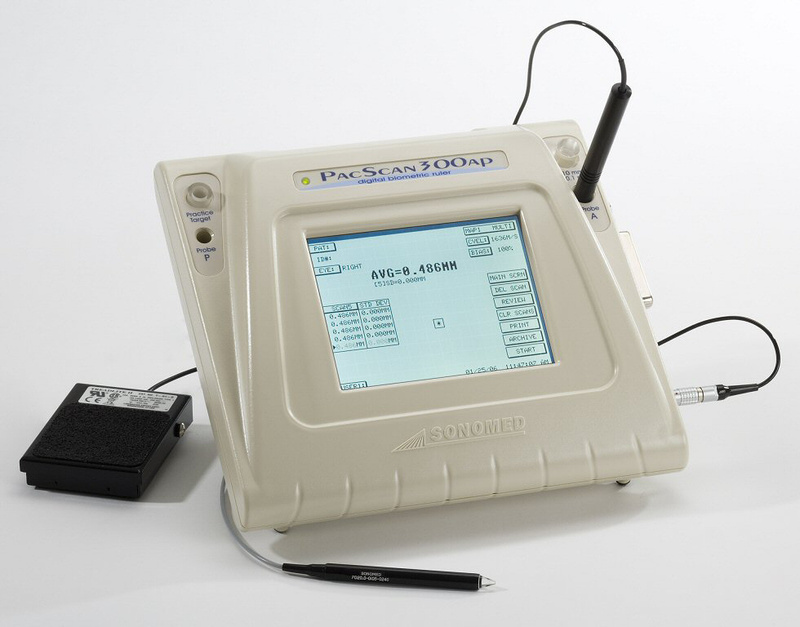 The PacScan is available in three configurations: as a combination A-scan / Pachymeter (300AP), stand alone A-Scan (300A), or stand alone Pachymeter (300P).